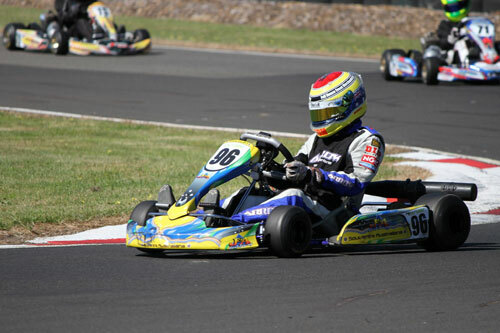 Warm conditions greeted competitors at Wimmera Kart Club’s sixth and final round of the Austrans Victorian Country Series a week ago, producing two days of fantastic racing on the gruelling 518m layout. 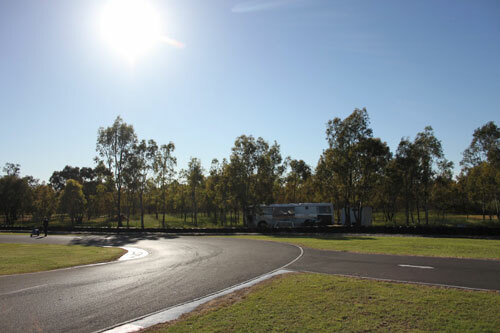 A healthy 107 entries took the immaculate circuit, racers and crews admiring and appreciating the efforts of the home club in presenting the facility in such condition. The racing was intense, with several classes series point scores hinging on the finals on Sunday. Series leader Brad Marsh Stepney started his weekend in fine style, convincingly winning heat one. 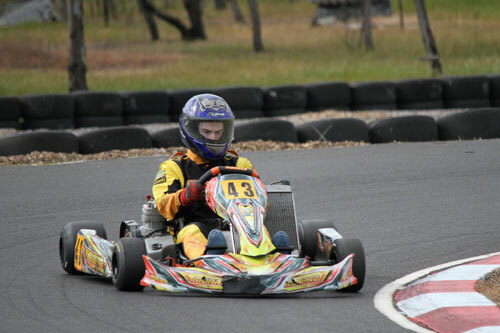 SA drivers Brad Saffin and Sam Baker filled the placings, some six seconds behind Marsh Stepney. 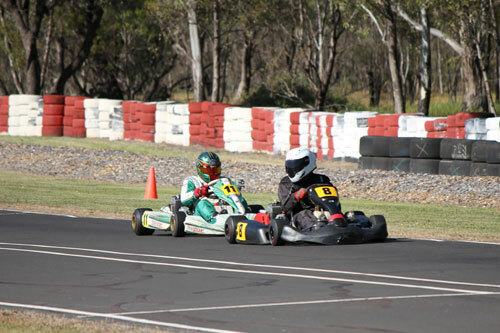 Former series regular Will Hawkes made his presence felt in heat two, winning from Jorja Ozimek and James Caddy. Hard charging Luis Leeds was unlucky to miss the top three, 19th to 4th. Marsh Stepney and Ozimek lead the field to the starter, Marsh Stepney taking the ascendancy whilst Ozimek’s race only lasted 3 laps. Marsh Stepney had a largely uneventful run on the way to another fine win, whilst Luis Leeds and Nick Carroll put on a hard charging display. Leeds driving from 11th to 2nd, Carroll from 14th to 3rd. A new addition to restricted light for the final round was Jason Lewer and he didn’t take long to make his mark. A first up win to Lewer, ahead of Sam Rofe and Lewers teammate Steven Malkin. Series leader Brock Rae struck back in race two, not being the fastest but doing what he needed to do to win. Malkin was again amongst the action in second ahead of Shaun Lyness, Lewer fourth. Seven tenths of a second covering the top four as they took the chequer. Rae and Lewer sat on the front row, with Rae getting the jump and leading from green to chequer. Lewer capped off a good weekend with second, Sam Rofe a deserving third place getter. Tag Light was always going to be an enthralling battle, with Ashley Lear leading the series point score by just a handful of points over Kyle Rethus heading into the final round. Rethus struck the first blow in heat one, winning from Jack Woodfall, Lear in third. Lear then kept his hopes alive with a great drive to victory in heat two, only to have Rethus follow him home ahead of Broe Shiells. Amazingly, Lear and Rethus did the same fastest lap time down the the thousandth in this race. So the scene was set with the two antagonists on the front row for the much anticipated battle. Rethus got the jump from pole and led from start to finish, but Lear was in his shadow the whole way keeping pressure on the new series champion. Woodfall and Shiells waged their own battle for third, both having the running before Woodfall made the decisive move with three laps to go. Another class to have the series in the balance was Sportsman Restricted Heavy, Barry Clough holding a slender lead over Chris Rodda heading into the final round. The two raced like champions all weekend, never removed from the top two in any of the events. Heat one saw Rodda get over Clough, John Owen taking third. Clough returned serve in heat two to win from Rodda and Court Griffiths. The final started and we were still no closer to crowning our champion, although Clough’s buffer looked tough to overcome. Rodda capped a fine weekend of racing to take the win from Clough, although it wouldn’t be enough to overhaul Clough for the series. Third place went to Court Griffiths, who also cemented third place in the series. Current Victorian Open and Closed Champion Scott King had already accumulated a massive points lead in Tag Heavy, so the main interest was in whether the champ could get all six final wins. And could he do it in his trusty Topkart following an unfortunate shunt in his Kosmic? Travis Millar had other ideas, and put on a faultless display of driving to take a clean sweep of the weekend, denying King of the record within his reach at the start of the weekend. Millar’s first heat was won over John Heath and King, whilst King and Andrew Hayes filled the minors in heat two. Millar won the final by under half a second from King, Heath holding off the freight train of Mick Angwin, Hayes, Kevin Hitchcock and George Johnson for third. Dylan Hollis had Junior National Light won two rounds ago and was expected to be missing from Horsham due to Race of the Stars in Queensland, but the little master arrived and did what he does best. Three wins from three events making for another clean sweep. Amazingly, Hollis only dropped two heats from eighteen in his stellar series. The series podium was still open for any of the top five. Callan Belmonte and Nick Cardamone filled the minors in heat one, Luis Leeds and Kirby Hillyer in heat two. Hollis had enough in the bank to hold out Leeds in the final, Hillyer taking a fine third to enhance his series position. Mathew Steel entered the final round with close to a full round lead and like so many of the other champions of the series, Steel laid down the law with a stunning clean sweep. Series challengers Nathan Williams and Cory Arnett filled the final two positions on the podium in heat one, Williams and John Doria in heat two. Steel and Williams skipped away from the field in the final, Steel taking the victory over Williams, who completed a card of seconds. Jay Coul moved up from his fifth place starting position to take a hard fought third bu a tenth of a second over Cadet champion Jonathan Cassar. If Chris Thomas was dominate in Clubman Heavy in 2012, there has not been a word to describe his performances in 2013. Thomas went into the weekend holding a massive lead and an opportunity to make it six out of six. Heat one saw Thomas and Paul Feely come together on the opening lap, resulting in their demise. Jack Woodfall capitalised to take a comfortable win over Matthew Crane and John Dankowski. Thomas rebounded for the heat two win, but was under immense pressure from Woodfall, who crossed the line a tenth behind Thomas, with Feely third. Thomas and Woodfall started the final together on the front row and waged a titanic battle. Positions changed numerous times before Thomas prevailed over Woodfall in a sensational race. A great way to end the series,and a magnificent achievement for Chris Thomas. Feely emerged from the battle between himself, Crane and Dankowski, with a rewarding third place. Kyle Rethus has been outstanding in two classes this season, but it is Clubman Light where he has been supreme in this series. Leading into the final round he had dropped three heats and won every final. And true to form, he continued his rampage at Horsham. Another clean sweep of proceedings saw this young man take the win and the awesome record of six wins in six rounds. Heat one was won by less than a tenth over Samantha Millar and third was Heath Jelbart. Jelbart and Danielle Missen took the minors in heat two. Rethus was pressured in the final by Millar, finishing less than a second in front. Millar took second place, followed by Jelbart in third. The Cadet champion had already been crowned, and Jonathon Cassar had moved onto Rookies. With Cassar out the door was wide open and several candidates were ready to assume the mantle. George Gower returned to the series after missing Hamilton and posted two wins in the heats. Great results for Kai Allen and Hugh Barter saw them fill second and third in the opening heat, whilst Kacey Mann pipped Barter for second in heat two. Gower and Barter were the front row starters for the final, Gower leading the opening lap before Barter took over the front running. But by lap four, the flying Courtney Prince had stormed into the lead from fourth on the grid, and drove on to a fine win. Gower, Mann and Barter staged a great battle, and race that they all deserved to be in the top three. 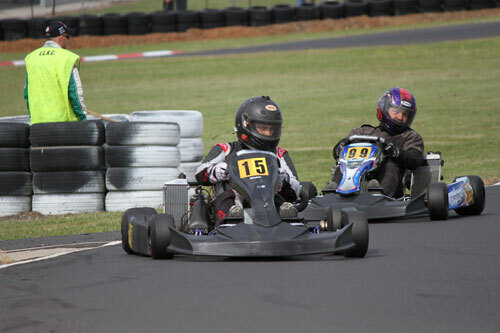 In the end it was Gower and Mann following home Prince, the form driver in cadet racing at the moment. Always a great class to watch, the old boys turned it on as they seem to do at each round. The top three of Craig Jelbart, Leon Forrest and Ron Taylor were all within striking distance of each other in the points. 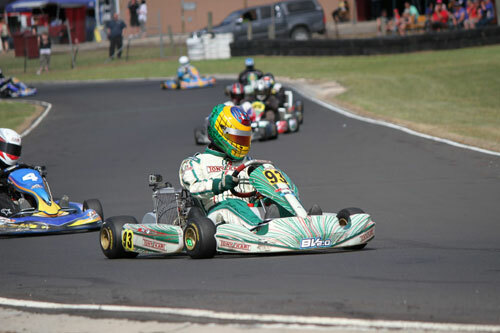 Jelbart hit the ground running and recorded two heat wins, all but securing the series victory. Taylor and Forrest shared the seconds and thirds, Taylor in front in heat one and Forrest in heat two. After the series that had been, much was expected of the final, surely the feathers would fly! Jelbart and Forrest led the field around on the front row, Taylor and Glenn Henley on row two. It was Forrest who got the flying start on his home track and led from start to finish. Jelbart and Taylor went to war and exchanged positions, before Jelbart grabbed the ascendancy. Final positions were Forrest, Jelbart then Taylor, but Jelbart had enough in the bank to score the series win. 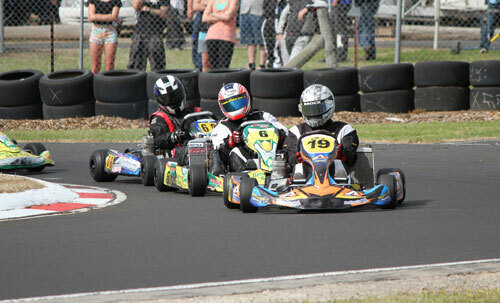 The Wimmera Kart club’s final round was a great way to finish a fantastic series, which saw close to 300 separate drivers try their hand at the series. Winners in this year’s series received the all new GO PRO Hero 3+ Camera, whilst all top five finishers received excellent quality prizes. Organisers gave away two full series passes for 2014, which will see Joseph Clough and Ashley Lear’s entries covered for the full series. 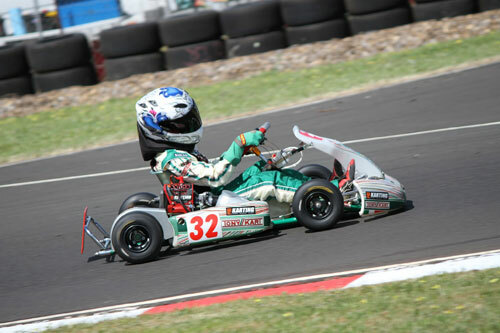 The Series is hoping to go bigger and better in 2014, so make sure you are at South West Kart Club on February 16 2014 when the Victorian Country Series goes racing! The 2013 Austrans Victorian Country Series was brought to you by valued sponsors Austrans, Remo Racing, All Star Graphics, Yes Optus Warrnambool-Portland-Hamilton, Shamick Racing and Yamaha Australia.